Obsessed with mascaras by the time Rimmel’s Extreme Volume Comb Mascara had come out, I just had to pick it up and try it. Now, what makes this mascara unique is that instead of having a brush like all the other mascaras, this one actually comes with a comb applicator. Just by combing it through my lashes, with one swipe only, I get long, volumized, sooty lashes. If you’ve been reading my blog for awhile, you’ll know that I never apply one coat and call it a day. When it comes to lashes, for me, more is more. With Rimmel’s comb mascara, I get to achieve the look I want by literally coming through my lashes. At a certain angle, it looks like there’s nothing at the end of the wand. That’s how slim the comb is. The teeth on the comb are coated with product which is why you can’t really see the comb all that well but I took photos of it at different angles to show you. Hopefully, you can see. Unfortunately, when I went back to repurchase my fourth tube of this stuff, I couldn’t find it, confirming my suspicions that the cosmetic industry make you fall in love with a certain product then discontinue it shortly after. You won’t find this (unless you get on ebay or something) but I hope this opens up your eyes (get it? 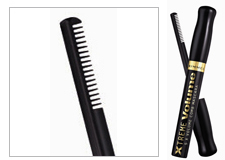 lawl) to other comb mascaras that are on the market. Personally, after this, I won’t ever dismiss a comb mascara without actually giving it a fair shot because apparently they can help you achieve greatness… or at least give you great lashes! 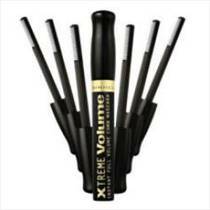 Unfortunately, this specific mascara by Rimmel has been discontinued.